Ok for those of us who did not listen to reason and decided to go cheap when it came time to look in the HID world for lighting or for those of us who are less fortunate and purchased a system for more than we should have and still ran into problems here is a little help. It may not help everyone since there are quite a few different systems made. Please use common sense when attempting this project. You should know your own limits as to how far you can work on your own car. If in doubt ask for help. Your results will vary depending on the system you purchase. Do not assume that these systems will not void part of your Mercedes warranty whether installed correctly or incorrectly. confused with the blue color dyed xenon filament bulbs that some of you are thinking of. This may not be as good as the factory system but it is cost effective alternative. I'm sorry if this seems a little basic to some of you who have done this or have mechanical knowlege. To others it may still not be enough info. From the research I have gathered I found out one could purchase these systems from ebay for as little as $80.00 and up to $380 for a H7 kit. There was a ton of claims from these sellers of which I found out many were just outright lies to sell their kits. o Warranty return no questions asked. It is also possible that these sellers just never had their kits installed in a Mercedes. Fortunately I found out one way to make many of these systems work on our cars. After the short amount of research I pick one of the cheap kits ($120) and found out what many of you already found out. These systems have flaws or won’t even work with the Mercedes electronics when installed as per instructions. Some of the cheap kits don't even have instructions! If you are fortunate enough to pick one of the better systems, you will not have any issues after your install. I started easy and decided to do the fog lights first. My reasoning was if there were problems I would still have my headlights. you are about routing your leads. The headlights will take a little more time. 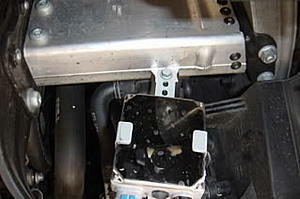 First raise the car to gain access to the splash shield behind the front bumper. 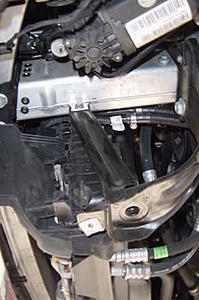 Remove the 8 – 8mm headed bolts and pull off the front splash shield. Note I have both the ballast for the headlight and the foglight installed already. 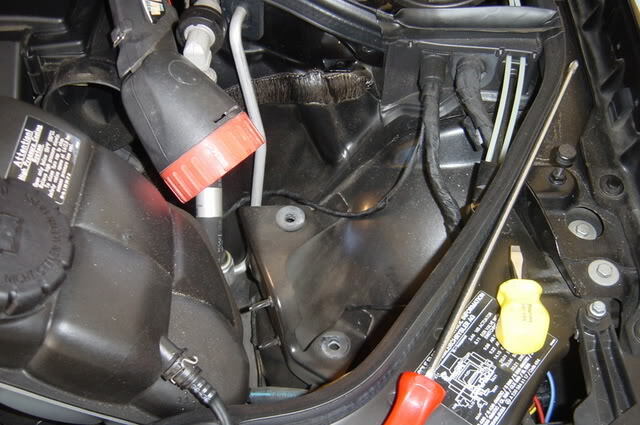 You will find plenty of room to gain access to the fog light bulbs and room to install the ballast for both the headlights and fog lights. 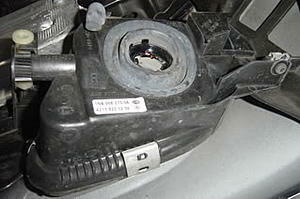 The fog light bulbs are easy to remove just turn counter clockwise about 1/8 of a turn and pull. 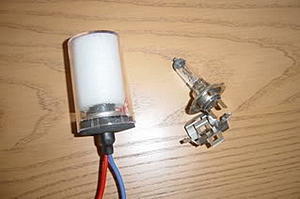 Check to see if you have the correct bulb in your kit. This is the back of the fog light with the bulb removed. Passenger foglight ballast installed on radiator support. 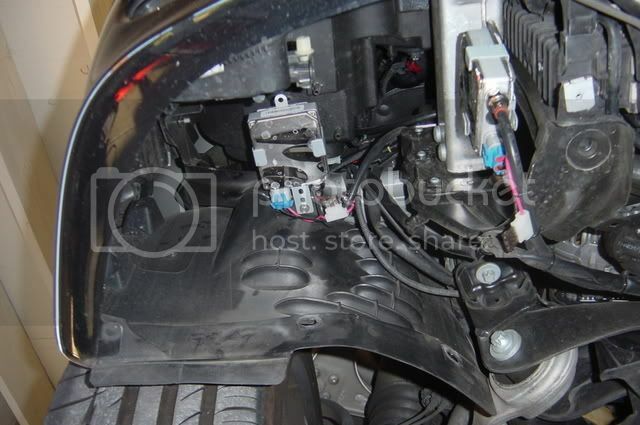 Same side with ballast installed for both the headlight and foglight. way that the tech will never see it. 1. 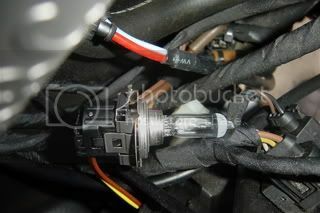 Plug the Hid bulbs into the headlight housings. 2. 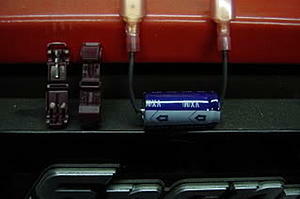 Plug the HID bulb leads into the Ballast. 3. Connect the OEM headlight plug to the Ballast power lead. Note the Brown wire is the Ground wire (negative lead) from you head light lead. 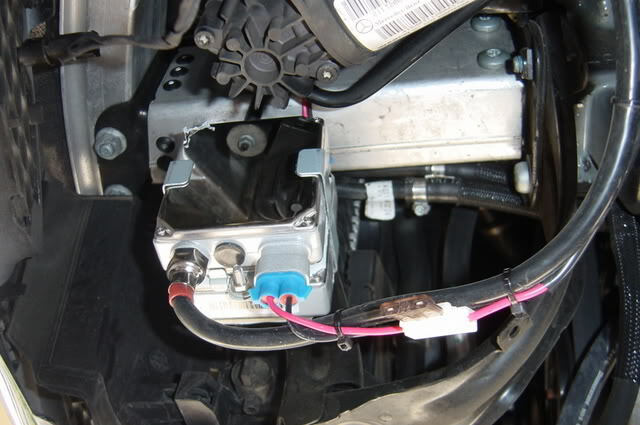 this is where the cheap systems meet the really cheap systems as some of the realy cheap systems have just a bare terminal for you to insert into your headlight plug. Use some dielectric grease here to keep water out. on the dash. Tie all the loose wires out of the way and button everything up. head lights too. When I did my headlights that's when my lights flickered a lot. crazy try this next step. we see this as a flicker. The second problem is with the headlight warning system. I installed a capacitor in attempt to fix this problem and it seems to work. and not set off a code. Because the headlight warning system sees the load it will continue to power the lights instead if flickering. Note your results will vary but for the 9 additional dollars spent it is better than throwing the HID system in the trash. 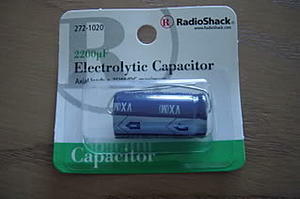 Do not install the Capacitor backwards as it may get hot and it is possible for them to explode. After running the lights for a while check the capacitors they should not be hot. If they are, please re-check your wiring, routing, and connections. Here is a diagram I was sent from one of the members 'No_Clue' (thanks Richard) since my Photoshop is currently not working. 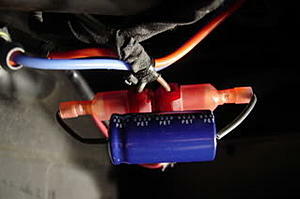 headlight plug and HID Ballast. a wall on level ground and adjust you lights. THE HEIGHT OF YOUR BULBS!!! Otherwise you will be blinding everyone! It should look like this. Use a small blade screw driver to remove the connector. Save the metal retaining clip and do not allow it to fall into the engine compartment! possible to keep any oils (like the natural oils on your hands) off of it. 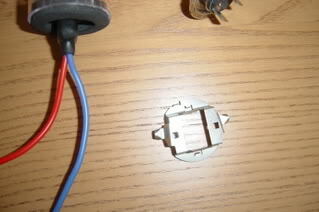 Take note to see how the retaining clip was clocked or phased on the old bulb. Remove the old retaining clip and install on your new bulb. room to work on the driver's headlight. 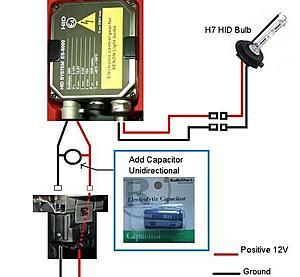 If you require the capacitors install them now on the power leads to the Ballast. assembly. Reinstall the other components. 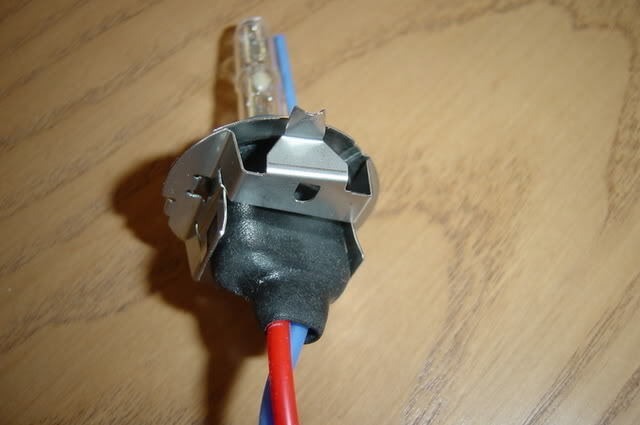 with seller's troubleshooting list as you may have a problem with a bulb or Ballast. Please use this information at your own risk and please use common sense when working on your own car. I do not teach or publish books and this was just to help out a few friends who were to far away for me too work on their cars. I can also update any changes to the install on this webpage. Last edited by health services; 04-06-2007 at 02:37 PM. Because of this mod, I have been driving so much at night for last weeks just want to make sure everything works fine. I have the capacitor mod for one week, been driving every night for long time. (hell...this is my first HID and I love it) NOT a single time, it gives me flicker or error msg!!!!!!!!!!!!!!!!! Great write up! Thanks! I'm seriously considering buying this kit off ebay but theres one thing holding me back. How bad do the headlights flicker? How about with the capacitor? I for one can speak for the mod also. Alan has the 2005 model. I have the 2003 model. Both car works fine!!!!! p.s. the kit I bought is only $133 shipped. NOT expensive one!!!!!!! Last edited by no_clue; 04-05-2007 at 06:02 PM. Awesome DIY.....very detailed!!! Thanks HS!!! This should be stickied! wall, as well as one in dark parking lot/street showing beam on the pavement? being the guinea pigs on this. Last edited by raymond g-; 04-05-2007 at 08:49 PM. Ray~ Will do that just for you! Here is the HID mod photo taking under 1/50 seconds shutter speed ( similar to human eye under dark enviroment ) and F3.2 ( this is from what human eyes "average" when encounter sudden light changes. Also head light aiming height has NOT been changed!!! Here is 65 feed away, where light heigh has down to the floor. Last edited by no_clue; 04-05-2007 at 11:44 PM. IF and ONLY if the OEM height setting has not been altered!!!!!! HID kit produce very little glare. P.S., I am using 4300K kit. For pure performance, not for the color effect. Those are very good pictures I tried to do the same pics but I have a cheap camera that will not take good pictures at night. I either need a good tripod or a steady hand for it to work at night and I have neither. Apt's underground parking is very good enviroment that simulate night driving w/ "ceiling light". And I like the 4300K kit...more OEM looks than after market. Maybe it is me, but I kind of think W211's headlight OEM height seems to be bit low.... But I will leave it as is for now. Compared to conventional lighting it does appear low. At least that's the way projectors tend to work. Because the projector is so precise (at least compared to conventional lighting) and intense in the cut off point any light above that cut off line appears very dim. since the fog light are reflector-type, I am still hesitate to do the upgrade. I have not had anyone flash me yet and I leave mine aimed low. It makes it incredibly bright just in front of me. Yet each time time I try to take a photo it shows a lot of glare that I don't see in real life. Maybe in the wet there is a reflection in the asphalt that may blind someone, but I don't remember the light pattern the fogs gave out in the rain. It will be a while before it will rain here again. Thank you, I think I got my idea of putting the HID in the fogs from you. 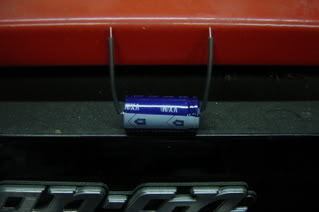 The flicker is just about non existent with the capacitor about one flick every 8-12 minutes and even then I think it is a problem with one of my ballast and not with the capacitor itself as it is almost always with the left fog light. Remember I bought a very cheap system. 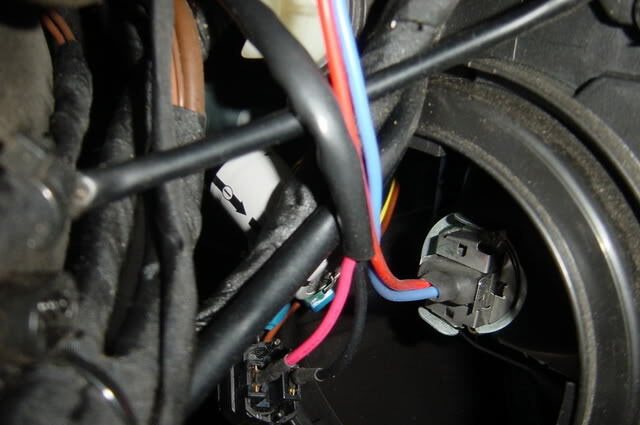 Ask 'W211 Ryda' if he has any flicker problem as he bought a system that is a little more expensive. tnx again guys. i PDFed this for reference and saved into my MB/HID folder !! As for the aperture, human's iris opens and shuts at approximately 4 stops, or a ratio of 16:1. This equivalent to the ASA range of the eye F16. Last edited by no_clue; 04-06-2007 at 03:14 AM. One thing I never got into was photography and I really wish I did get more into it. All I got is a point and shoot and never knew there was anything you could adjust on these. I'll have to borrow my sisters one day. I think I’ll be just as confused with that one with all the adjustments on it. You've done a really nice job! health services I just wanted to thank you again for this write up and the info on the capacitor mod. I installed a cheap HID kit off ebay ($103) I was getting horrible flickering as depicted in health service's video. I then did the capacitor mod and they have been working absolutely FLAWLESSLY since. No bulb out warnings, no flickering or anything. used the capacitor that was recommended and my install went without a hitch! thanks!